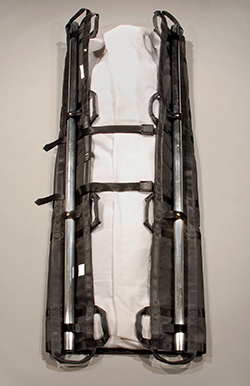 The Tuxedo Body Sled is the trade name for the mortician stretcher manufactured by Caregivers Aide. 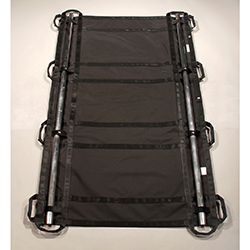 Funeral Directors and those in the mortician industry find the Tuxedo Body Sled to be a great help in moving remains from tight spaces where other equipment won't work. The Tuxedo's flexibility makes it ideal for getting around furniture, tight hallways, narrow doorways. 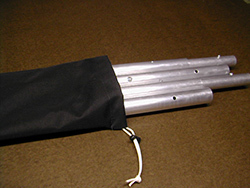 36” or 42” have ability to be rigid when needed with use of accessory poles. 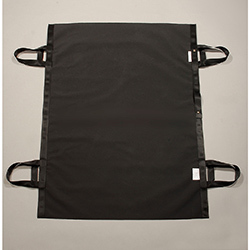 Poles accessories (sold separately) have their own storage/carry bag included. Weight limit up to 400 lbs. Customization of straps available. Please call for quote. Tuxedo may wear out and need to be replaced but poles will last forever. PDF instructions: These instructions come packaged with the related products.